On September 27th, the United Nations's Intergovernmental Panel on Climate Change (I.P.C.C.) came out with its latest report; it took six years to compile by more than 800 top scientists who cited over 9,000 scientific studies from all over the world. And their findings are ominous and incontrovertible. Even Climate-Change deniers did not run amuck with this report as we at the Frog Blog had expected. This is because the anticipated revisions of the I.P.C.C. calculations were actually worse in some cases for our planet, not better, as some Climate-Change skeptics had been expecting based on a leak of the report in September. Read the article about the leak in the right-wing UK tabloid, the Daily Mail, click here. ~ A rise of 4.8 degrees Celsius is possible this century, click here. The United Nations panel now confirms with 95% certainty that humans are the cause of Global Warming. See our earlier article on how scientists came to that conclusion, click here. And global sea levels are expected to rise this century by 26 to 82 centimeters (10.4 to 32.8 inches); coastal cities around the world are likely to be dangerously affected. And the Arctic is expected to be ice-free in the summer time by 2050, spelling disaster for numerous species. Greenhouse gases such as carbon dioxide, methane, and nitrous oxide are now at unprecedented concentrations in our atmosphere not seen for more than 800,000 years. In addition, it is expected that the temperature on our planet will rise anywhere from 0.3 to 4.8 degrees Celsius (0.5 to 8.6 degrees Fahrenheit) by 2100. This is a total catastrophe as this upper limit is more than twice the temperature-increase target of 2 degrees Celsius (above pre-industrial levels) set by all countries at the 2009 United Nations Climate Change Conference in Copenhagen. ~ Is the I.P.C.C. actually overly conservative with its estimates? But some climate scientists, like NASA's James Hansen, think even the 2-degree target is too high, click here. In fact, some scientists have charged that the I.P.C.C. – contrary to the claims of exaggeration by the Climate-Change skeptics – has been unduly overcautious with its predictions. Dr. Michael Mann, director of the Earth System Science Center at Pennsylvania State University, thinks the expected increase in global sea levels may be as high as 2 meters or 6 feet by 2100, more than double the forecast made by the I.P.C.C. ~ Climate-Change skeptics focus on the "Global Warming pause." Due to the past complacency of governments, it is likely that Global Warming is now irreversible and all mankind can do at this stage is to mitigate the damage, click here. The I.P.C.C. strongly urges decisive action on the part of policy-makers around the world, such as further reductions in the emission of greenhouse gases. And as a part of their mitigation strategy, nations must now seriously consider upgrading building codes and start building surge barriers, levees, tide gates, and other structures to protect their low-lying coastal cities. ~ Rush Limbaugh says Climate Change is a conspiracy. Moron. However, Climate-Change deniers are determined to make matters worse for our planet. But since this latest I.P.C.C. report does not offer them much fodder, they now rely on an old fallacy called the Global Warming "pause." It is an ignorant and idiotic notion. Christiana Figueres, the Executive Secretary of the UN Framework Convention on Climate Change (UNFCCC), says Climate-Change deniers have a "primitive understanding" of climate science, click here. ~ From 1880 to present. Source: NASA. In our last article, "Arctic Ice Grew By 30% – Global Cooling?" it has been brought up that the long-term downtrend of the Arctic ice doesn't move in a straight line, it moves in oscillating waves due to the fluctuations in the natural climate and weather patterns. The same applies to the surface temperature of the Earth. Climate-Change deniers are claiming that the surface temperature has not risen in fifteen years. They say this phenomenon is proof that Global Warming is a hoax. 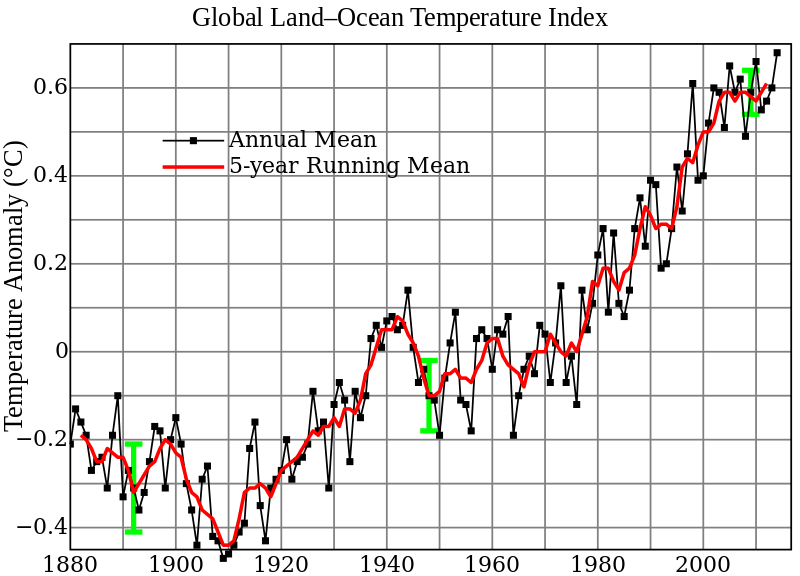 But as one can see in the chart above, the temperature of the Earth oscillates in the short-term, with the long-term uptrend still intact. In fact, the temperature of the Earth actually has gone up in the last fifteen years, but at a decreasing rate and at below expectations. ~ Global Warming is real. Also, since global temperature records were first kept in 1850, it was observed that sunspot activity tended to correlate with the Earth's temperature; but since the 1980's, solar activity has dropped while the Earth's temperature has continued to rise. This coincides with the stark rise of CO2 in the atmosphere. Therefore, one could argue that if not for Global Warming, surface temperatures would not only have flattened in the last fifteen years but instead would have fallen for three straight decades since the early 1980's. So, if sunspot activity picks up in the future, surface temperatures may spike. ~ The relationship between sunspots and temperature diverges. Finally, scientists claim that the heat and energy on the surface of the Earth are likely being absorbed by the ocean, slowing the rise of surface temperatures. But the rising temperature of the ocean will still have adverse effects on our planet, such as in the acceleration of the melting of sea ice as well as in the global increase of violent precipitation patterns. Some experts believe Global Warming is likely the cause of the dramatic decline of the Alaskan crab fishery, click here. In fact, the International Programme on the State of the Ocean (IPSO) has recently declared that because of Climate Change, the warming waters, ocean acidification (highest rate in 300 million years), and decreasing oxygen are all bringing about the mass extinction of species in the oceans, click here. ~ Weather patterns go haywire. (October 18, 2013) Yesterday, the World Health Organization, an agency of the United Nations, declared that air pollution causes cancer. The International Agency for Research on Cancer said that air pollution is as bad as tobacco, asbestos, and ultraviolet radiation. ~ World Health Organization links air pollution to cancer. We hear all the time that clean energy is more expensive than fossil fuels. That is a fallacy. Fossil fuels do not factor in externalities into their pricing; an externalty is a harm (or benefit) that affects unrelated parties such as public health, wildlife, the environment, global climate, and others. (May 6, 2014) Here is a quote from today's National Climate Assessment update: "Climate change, once considered an issue for a distant future, has moved firmly into the present..." It also states that evidence of man-made Climate Change "continues to strengthen," and "Americans are noticing changes all around them." For more information on this White House report, click here. ~ We must all learn to live with Climate Change. This is no big surprise to FrogBook.com and it should not be to most informed and reasonable people. The issue here is not whether Climate Change (or Global Warming) is here. It has been here for years, if not decades. The main issue is whether Climate Change is reversible. And as we've reported earlier, it is likely IRREVERSIBLE. Unusually more frequent and severe incidences of tornadoes, hurricanes, wildfires, droughts, mudslides, and floods are here to stay. All we can do now is to mitigate the problem by being prepared.